As part of a collaborative effort between myself and Stan from Hitman Paintball (you may know him from several of his very popular Youtube videos), we got together and tried to come to a compromised consensus as to what the top ten Milsim markers are/were. Steve from 68Caliber was kind enough to agree to assist in the syndication of this list, and will also be hosting the feature on his site. This .60 caliber bad boy was a real game changer when it was first released in 1987. 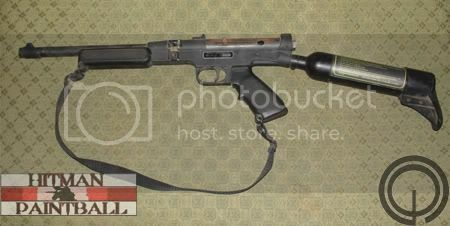 It boasted fully automatic firing and a clip fed loading system. This first mass produced marker to break the pump/single action barrier. It had the ability to fire in both semi auto and full auto. It was also one of if not the first marker to emulate a real military service weapon making it the grandfather of all Milsim markers. Unfortunately it suffers in the performance department from the use of stripper clips which were cumbersome and not very fast or easy to reload compared to other markers. Also it may be worth to note it was banned at many fields due to safety concerns and Full auto mode (which was viewed as unfair and unsafe at the time).